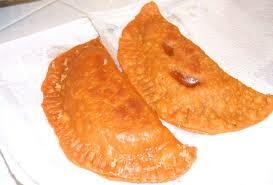 Pastelillos de Carne - Meat Turnovers - Tienditadepuertorico.com - Buy Puertorican Food Here!! 4-1/2 inches wide. Fill one side of each circle with 1-1/2 tablespoons of picadillo. and place on an ungreased cookie sheet. Bake for 30 minutes, or until golden brown.